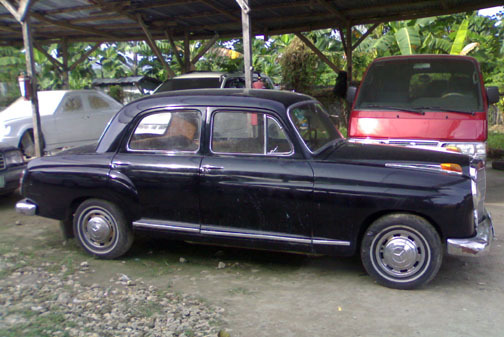 Finally, my long-time quest for a classic Mercedes-Benz Ponton came to an end. 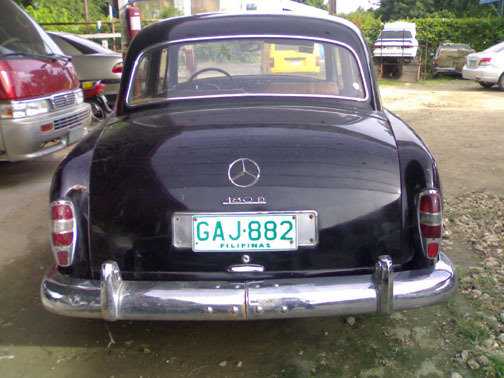 Inspired by Mr. Lorenzo Pacho's 180Db, my 180Db adviser and fellow enthusiast - attorney Bobby Gonzales, and Mr. Jojo Solis drove me to appreciate the OM 636 diesel engine, and kept the fire inside me burning to acquire a legendary Ponton. Thanks so much for the help. I will be very happy to hear comments, suggestions, and of course compliments! The photos with the DB 040 black paint are from before the restoration. 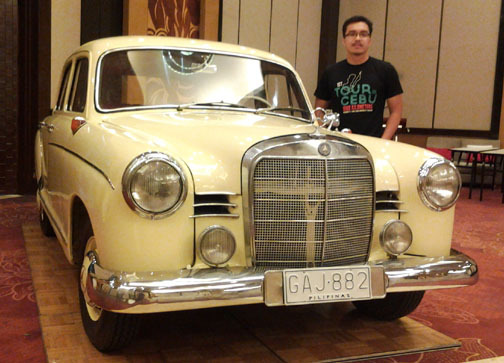 "Less Racey, but Glamorous and Classy"
This Mercedes-Benz Type 180Db Ponton – a rare (probably the only one left in Cebu City) 56-year-old classic car enthusiast’s dream was restored to its original grandeur, and painted DB 620 Ivory. Notice the same registration (GAJ 882) in both sets of photos. 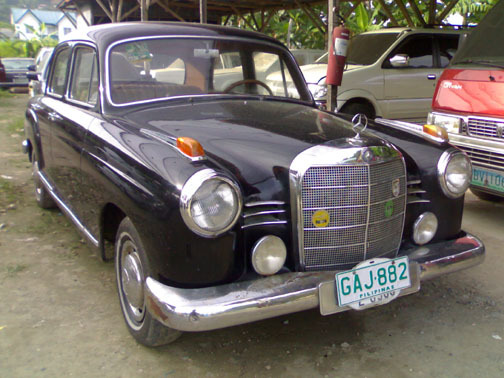 The Mercedes-Benz Ponton diesels were a favoured choice of European families and taxi drivers alike, and considered to be the most durable and versatile cars behind the silver star during that era. 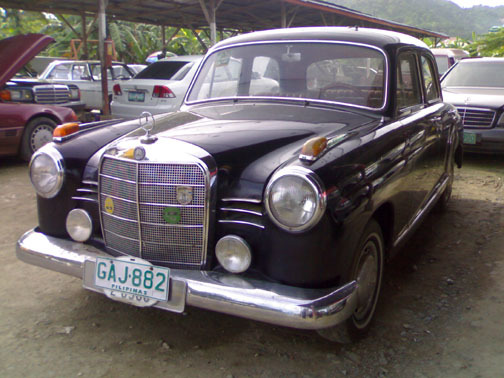 The Mercedes-Benz 180D/180Db/180Dc Pontons were the the most popular sedans of the Daimler-Benz line-up. 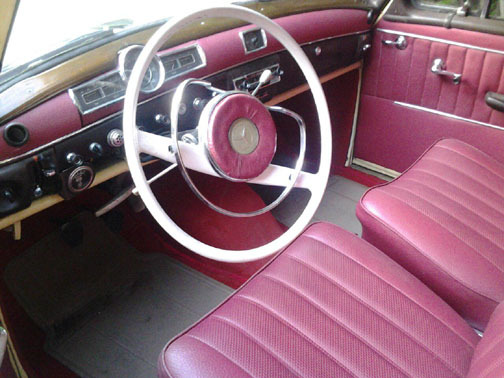 They were produced between 1954 to 1962. 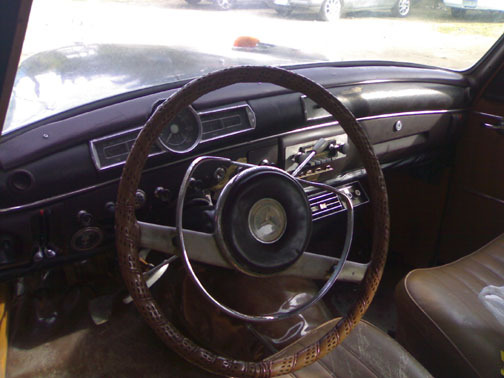 In mid-1959 the four-cylinder Ponton sedans were updated with changes to the interior, grille, bumpers, and tail lights - as shown here. The name Ponton was derived from the "Pontoon bridges" used to transport vehicles in the absence of a bridge. The Pontoon floater has a plump, steel, barrel shape - similar to the fenders of the legendary MBZ Ponton series. The design of the 180Db bespeaks an aristocratic nature. 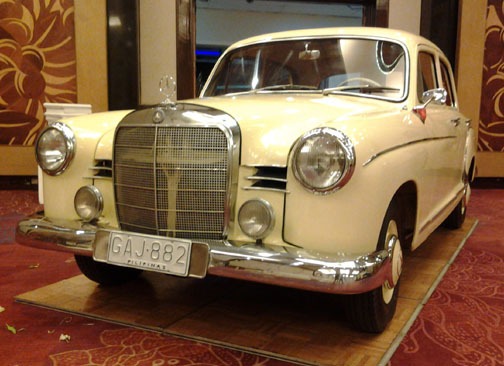 The old values of artisan craftsmanship were moulded with legendary German engineering to produce a car that took 25 man hours (roughly three work days) to complete. Somewhat less racey, but glamorous and classy. Only a handful remain running and restored after so many years. 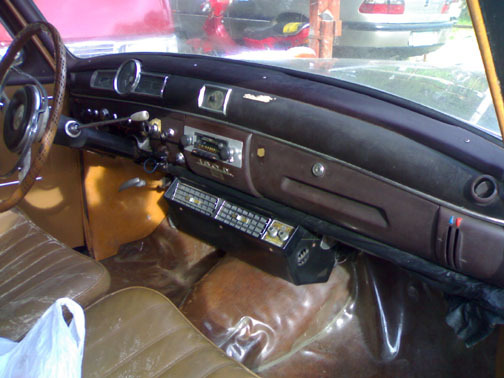 This model has an original OM 636 diesel engine, "Bakelite" interior trim, as well as the period-correct Becker "TG" radio. As a purist, I can attest that it is in showroom condition and working perfectly. 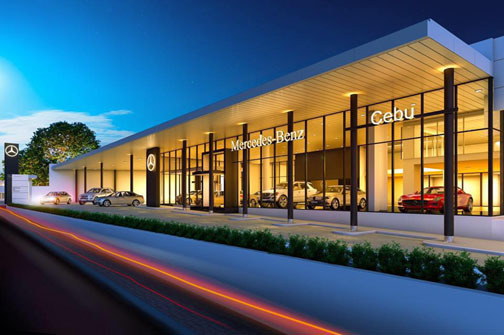 A gradual and meticulous restoration effort was undertaken over a span of three years, and completed in July 2015 to cater to the needs of Global Star Motors Corporation’s Mercedes-Benz "Heritage Corner" in Cebu. 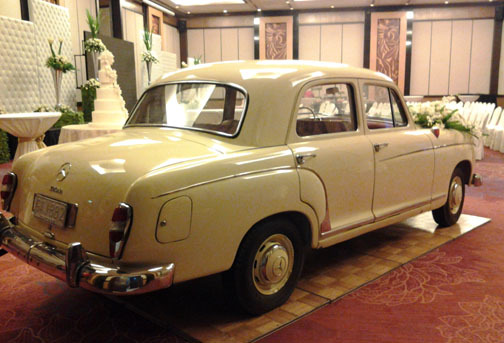 To continuously carry the torch, and be a good steward of the legendary Ponton – for its upkeep and maintenance, it's hired out as a wedding car for friends, and enjoyed as a family Sunday driver. 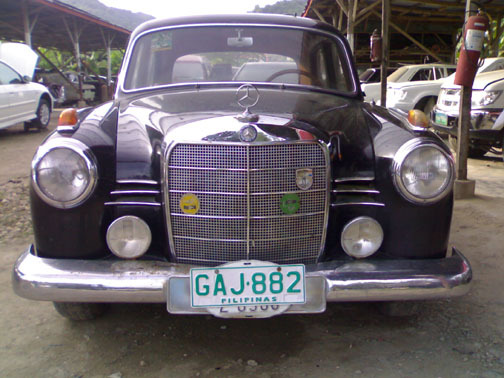 The Mercedes Benz 180Db Ponton will not win many races but will surely turn heads and leave smiles. As my father, Steve Padilla said, "Toto, it’s not the miles per hour but smiles per hour."